My second blog backupinferno.de with Twitter-account started today. There will be articles about backup & restore, storage, etc. in German language. Dropbox is a cloud storage provider. Synology builds modern home NAS. Synology’s NAS features can be extended by using plugins. Until now I missed a plugin for connecting Dropbox. There are 2 developers. Jonathan Poland has created Synology-plugin Synobox, which is available in version 0.4.6 as spk-package for download. This early version doesn’t support Unicode (non English characters) and is only a one way synchronzation from dropbox to Synology at the moment. I asked the developer about these features but he said that time is limited because of his job. Christian Bourgeois created a branch recently. He’s working on the missing features and it’s still work in progress. Advanced user with knowledge of version control systems und Python might want tocreate a package by themselves. First of all you’ll need a Dropbox-account. After that you have to become an app developer by clicking “create an app”. 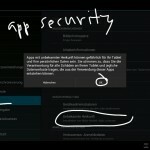 Choose an unique app namelike “synobox_user0815” select “app folder” for access level. Press “create”. You may customize the “name of app folder”. 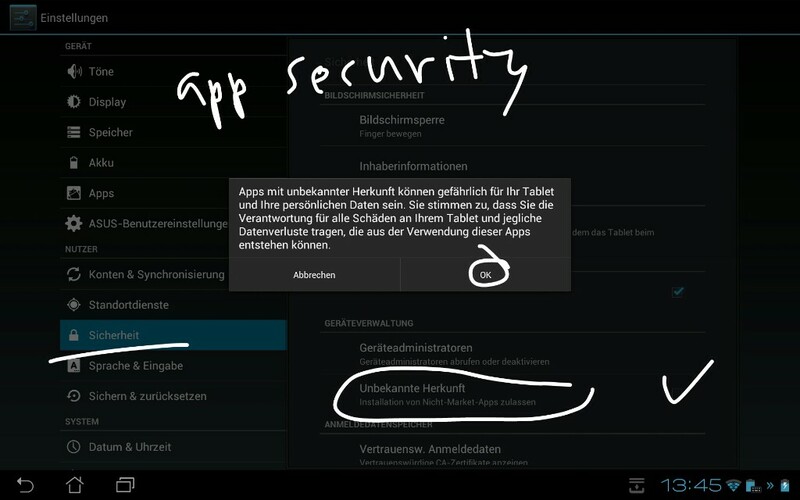 Please note the values for “App key” and “App secret and press “update”. Login to your Synology GUI called DSM by using a browser, use URL http://192.168.x.x:5000/webman/index.cgi (customize IP-address!). Install and start package Python which is provided by Synology. Download, upload to DSM and install package Synobox. Create a shared folder, e.g. “dropbox”. User “guest” has to be granted write permissions. Start ssh daemon. Fill in correct values and save the file. After that start URL and press “authorize”: http://192.168.x.x:5000/webman/3rdparty/SynoBox/index.cgi (customize IP-address of NAS!). A subfolder will be created in folder Apps at Dropbox. Some weeks ago an upcoming version of XMBC on Android was anounced. Now the very first alpha version is available for installation. XBMC is a free mediacenter software. It provides functions to organize media (audio, video, photo) and play these files (mediaplayer). XBMC is also able to run as media server. Media access can be achieved via several sources, like local filesystems as well as network SMB/CIFS (Windows shares), NFS (UNIX/Linux shares) and UPNP/DLNA (mediaserver). Android is a well known operating system for mobile devices like smartphones and tablets. The upcoming console Ouya (gaming console and mediaplayer) also uses Android. 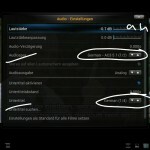 As preparation for installing XBMC on Android you have to change settings. Alternate install sources have to be enabled. If you own an Android device without NVidia-chip choose “non-NEON” for installation. Another version for devices with other chips will be available later. If XBMC has to be used as UPNP Renderer (player) or server you have to configure that in XBMC system settings. XBMC is able to play audio, video and photo from local and network sources. But playing videos isn’t the only topic covered by XBMC. 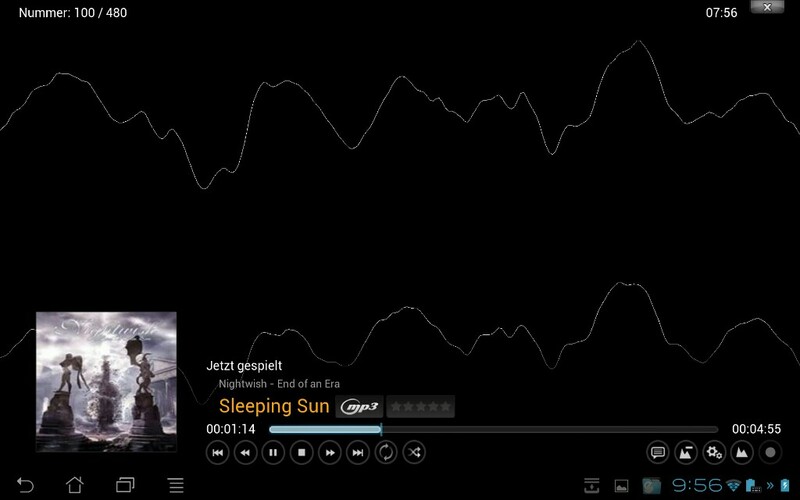 It is also very good in displaying internal and external subtitles (by using cifs or nfs on network sources). 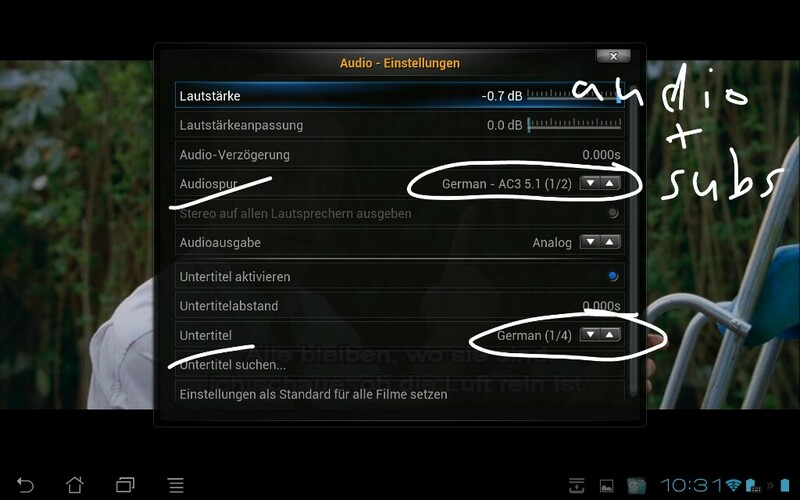 Also selecting an audio stream in a different language is no problem. There are serveral plugins for XBMC, e.g. 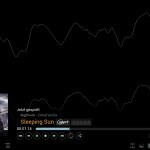 Mediathek plugin for watching German tv stations. I have tested this early version of XBMC for Android on my Asus Infinity TF700T tablet. It’s running pretty stable for an alpha version. There’s stuttering on some codecs because hardware acceleration is still work in progress. There’s also no high priority in improving enegy management. 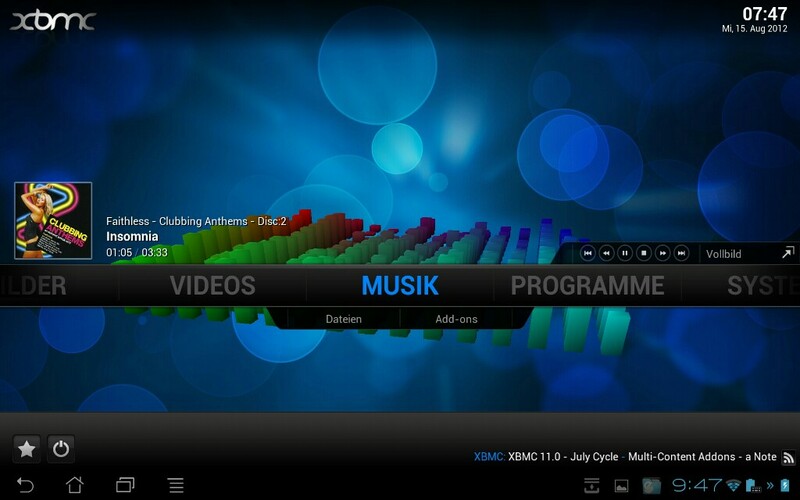 I think XBMC will be one of the top apps for Android in near future!